No matter where or when you bought your BMW, Medford BMW delivers after-warranty repairs and BMW maintenance at independent repair shop prices. 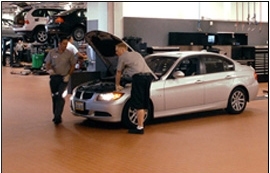 You'll get the same high quality attention from our BMW trained and authorized auto technicians as you can expect when you buy brand new. Medford BMW will tend to your BMW while you make yourself comfortable and enjoy wireless internet, television and complimentary refreshments in our on-site café. Conveniently located at 4600 Grumman Drive.